These are a few things you can do as a Ham. We will be adding more items based on club members interests. Upcoming description will include: DXing, antenna building, APRS, digital modes, software defined radio (SDR), and other things that we find fun! Jamboree on the Air JOTA is an annual Scouting event that uses amateur radio to link Scouts around the world, around the nation, and in our community. It is held the third weekend in October. It is not a contest - just a way to get youth involved with Ham radio by making QSO's with other scouts and Hams around the world. It is fun to to take our portable 55 foot radio tower trailer to a new location, set it up with a tri band Yagi antenna and help scouts make their initial radio contacts. Equally fun is to make contacts with scouts in other countries learning about where they are and what they are doing. Several club members have interest in JOTA activities and would like to encourage you to join them in October for JOTA! Contests can be exceptionally fun and challenging - for some Hams. Througout the year there are radio contests where Hams make short QSO's with other Hams using a short "exchange" message. Contests range from highly competitive events to those which are casual, cordial exchanges. The beauty of contesting is that there are so many radio contest choices you can find something to your liking. Playing in a contest helps build your communication skills. You learn how to pass short, clear messages. Contests are a great place to try out new antennas, as there are many Hams that want to make a short contact. Don't expect much in terms of audio quality reports, but you can find out how well your antenna is reaching parts of the country or world. As you progress you will want to learn and will experience the variability of propagation at different times of day and year. Contests use phone (i.e., voice), digital, and CW. They may be on the HF or VHF bands. Thus depending upon your equipment, skills, and interests you will be able to find a contest of interest. Several club members do participate in contests and are very willing to share this part of the hobby with you. Have some fun, join in, reach out to some of our contesting Hams. Summits on the air combines the fun of hiking, mountain climbing and Ham radio. 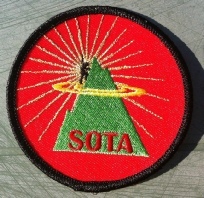 Initiated in Great Britain, SOTA is now a world wide activity. Activators climb peaks with their radio and make contacts (QSO's) with Chasers. They exchange signal reports and information about the peak. Activators usually post notices of when they will be on a peak at SOTA Watch, making it easier for them to link up with chasers. Points are gathered by Activators and Chasers for each contact. It is exciting to be able to make contacts with others from the top of a peak. Some peaks are very challenging to reach. Radio, antenna, and power choices need to be carefully chosen for portablility and weight reasons. Given that you may have a clear line of sight from the peak, you may make contacts 100's of miles away with just a handheld radio. Or you may want to use HF and CW to get beyond line of sight. The challenge of reaching the peak, choosing equipment, and making contacts can be quite rewarding. Several club members have interest in SOTA activities and are eager to share their experiences. Throughout 2016, Amateur Radio helped the National Park Service celebrate their 100th anniversary. Hams from across the country activated NPS units to promote the National Park Service and showcase Amateur Radio to the public. Our club activated Santa Monica Mountains Recreation Area on May 14. In addition club members chased parks and activated parks. To learn more about radio communications and equipment use in the field, see this briefing for an example of some NPOTA activation lessons learned.